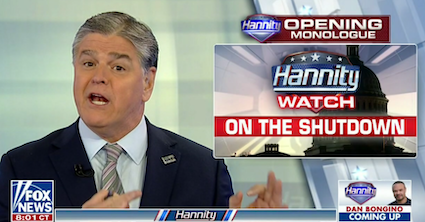 Sean Hannity found lots of things to rant about on his show this Thursday night, but none of them included Rudy Giuliani's bombshell admission about Russian collusion and the Trump campaign. After Rudy Giuliani dropped his huge bombshell suggesting indictments are coming against the Trump campaign for conspiring with Russia, you’d think that Giuliani or someone of importance in Trumpworld would have run to the Hannity show to “clarify” or deny the implication – that is, unless it is what it seems. By now, you probably know that Giuliani told CNN’s Chris Cuomo Wednesday night, “I never said there was no collusion between the campaign or between people and the campaign.” That was a lie that Fox News completely debunked yesterday in a report that also included footage of Trump saying there had been no collusion between the campaign and Russia. More importantly, Giuliani’s revision of history suggested he was conceding there had been collusion involving the campaign that we would probably learn about soon. The Hannity show silence on the subject further supports that conclusion. If there is one platform that Giuliani or someone from Trumpworld could count on for the exact messaging desired, it would be the Hannity show. Heck, Trumpworld can even count on host Sean Hannity helping to craft the messaging. And yet Hannity said nothing on the subject. 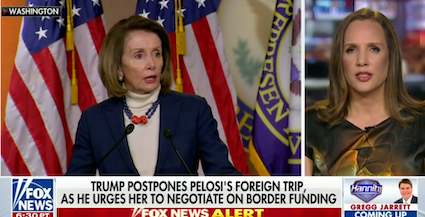 Hannity opened the show with a nearly 20-minute rant about the government shutdown, the border, Nancy Pelosi, Democrats and the media. 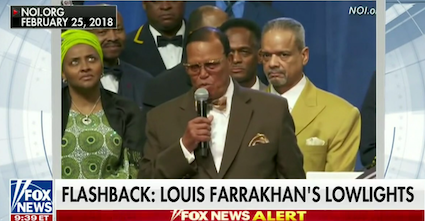 That included a reprise attack on one of his favorite targets, Louis Farrakhan. Another chance to obsess about Farrakhan! 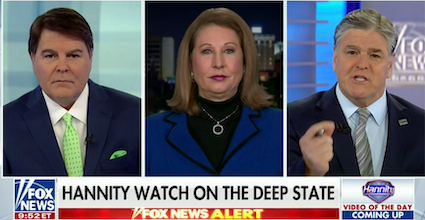 SYDNEY POWELL (GUEST): The Mueller witch hunt should be ended immediately and the entire team should be disbanded and they’re the ones that should be investigated. GREGG JARRETT (GUEST): The bottom line here is there was no Trump collusion but there was Hillary, FBI, Department of Justice collusion and four people on Mueller’s special counsel team involved. 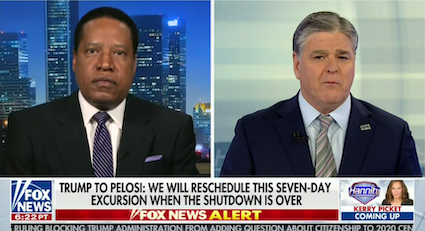 HANNITY: And also, we know that they literally lied to the FISA court and committed fraud. 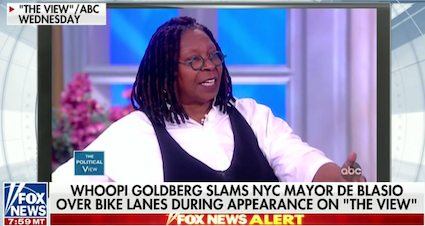 Before closing, Hannity played a clip of Whoopi Goldberg criticizing New York City Mayor Bill de Blasio over bike lanes. 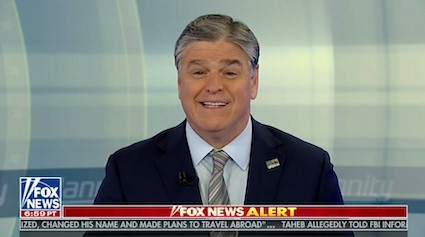 Watch Hannity spend six minutes attacking the Mueller investigation without mentioning Giuliani above, from the January 17, 2019 Hannity.